SQLMap is the most flexible Sql injection tool I have ever seen: written in python, opensource and fully customizable. Many times during penetration testing activities you will face the need to customize SQLMap. In the following example the tool is not able to extract any data in it's default configuration since the application is filtering some particular characters. Even if data validation is not neat, it limits for sure standard pentesting tools. As we can see from SQLMap logs, bisection algorithm cannot work if the ">" character is filtered. In addition initial checks will not be able to discover that "id" parameter is injectable. --dbms=mssql --string="This article is about politics"
3) Rewrite blind queries without filtered chars (in this case "<", ">"
parameter is injectable or not. Since we already know that the parameter is injectable, we make SQLmap skip this check. Added the following line at line "98"
or not. For Example if we already know that the database is MSSQL because of the "convert()" check. Modified the following line at line "233"
In the following scenario I have rewritten Queries for MSSQL Server. sign), < (left angle bracket),> (right angle bracket), " (double quote) and ' (single quote). WHERE id LIKE (SELECT id FROM %s..sysobjects WHERE name LIKE '%s')"
DOMinator is a Firefox based software for analysis and identification of DOM Based Cross Site Scripting issues (DOMXss). 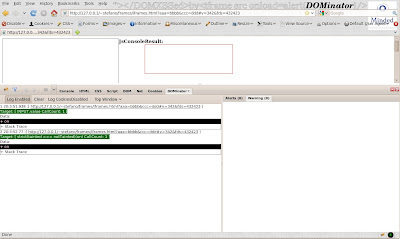 It is the first runtime tool which can help security testers to identify DOMXss. It uses dynamic runtime tainting model on strings and can trace back taint propagation operations in order to understand if a DOMXss vulnerability is actually exploitable. In the topics of DOMXss possibilities are quite infinite. 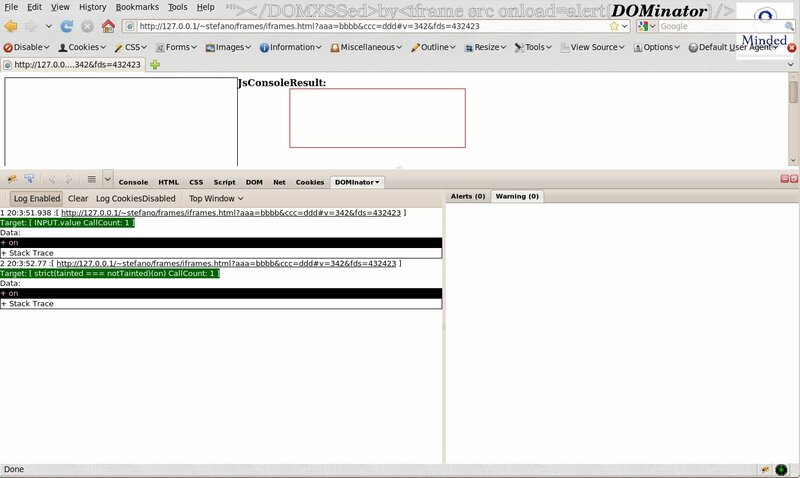 At the moment DOMinator can help in identifying reflected DOM Based Xss, but there is potential to extend it to stored DOMXss analysis. Start from the installation instructions then have a look at the video. Use the issues page to post about problems crashes or whatever. And finally subscribe to the DOMinator Mailing List to get live news. A video has been uploaded here to show how it works. Soon I'll post more tutorials about the community version. We downloaded top Alexa 1 million sites and analyzed the first 100 in order to verify the presence of exploitable DOM Based Cross Site Scripting vulnerabilities. Using DOMinator we found that 56 out of 100 (56% of sites) were vulnerable to reliable DOMXss attacks. Some analysis example can be found here and here. We'll release a white paper about this research, in the meantime you can try to reach our results using DOMinator. DOMinator is still in beta stage but I see a lot of potential in this project. Logging can be saved in a DB and lately analyzed. Per page testing using Selenium/iMacros. A version of DOMinator for xulrunner. It only depends on how many people will help me in improving it. So, if you're interested in contributing in the code (or in funding the project) let me know, I'll add you to the project contributors. We have some commercial ideas about developing a more usable interface with our knowledge base but we can assure you that the community version will always be open and free. In the next few days I'll release a whitepaper about DOMinator describing the implementation choices and the technical details. Stay tuned for more information about DOMinator..the best is yet to come. DOMinator is a project sponsored by Minded Security, created and maintainted by me (Stefano Di Paola). Finally, feel free to follow DOMinator news on Twitter as well by subscribing to @WisecWisec and @DOMXss.